(which fits the STS AV7600). Plugs into 110-120VAC wall outlet. Other end plugs into bottom of battery. Charge output is approximately 250mA/hr. Re-charges BP-STSxe battery fully in about 8 hours. 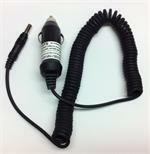 CP-STS : DC Power Cord for the STS AV7600 Aviation radios. One end plugs into top of radio; has coiled cord, the other end plugs into 12-13.8VDC lighter socket. Provides mobile Hi-watt power to the radio. 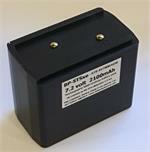 BP-STSxe: 7.2 volt 2100mAh LONG LIFE rechargeable Ni-MH battery for STS AV7600 & AV7600AOR Airband radios. Arrives PRE-CHARGED & READY TO USE. Re-charges with Plug-in Wall Charger (WC-STS) or OEM Rapid Chargers.